Do you need to look up a word? Or you need to verify a term? Sure, doing a Google search via your browser is always a possibility—but wouldn’t it be great to have an app that can help you out with such things? 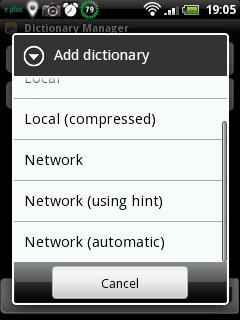 Especially one that comes with an offline dictionary, meaning it can be using even when you don’t have internet access? Fora Dictionary is that kind of app. Read on to find out what makes Fora so special! 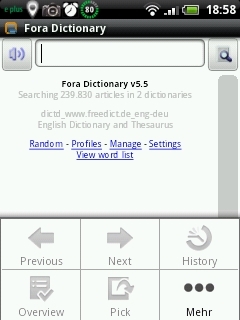 Fora Dictionary is both an online and offline dictionary. In case of the latter the app can make use of a while bunch of different formats: StarDict, XDXF, DSL, DICTD, as well as the plain-text TSV format. 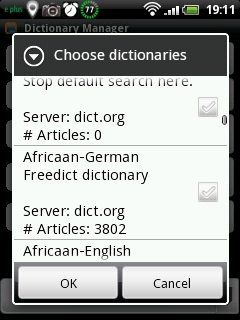 The dictionaries are installed on your SD card und used by Fora for quick access. This can take a bit of time, but it only has to be done once. 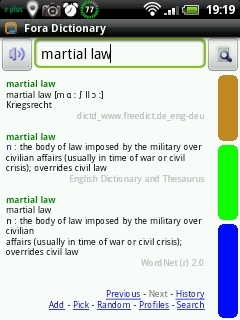 Suitable dictionaries can be found online, for instance on yelou.com which has the StarDict collection. Packages are also available on the Market; these can be found and downloaded via the app. Fora Dictionary is pretty good at finding online dictionaries: it can be done via automatic search (the app adds all automatically found addresses), or you can enter a key word to specify your search (e.g. ‘Italian’ or ‘Bible’). A third option displays every available source that you can then go through and select links manually. Entering a URL manually is also possible. You can assign a color to every dictionary (online and offline) as well as select which order they should be displayed in. For instance: if you want to look up a Spanish word but couldn’t find what you’re looking for in an English-Spanish dictionary you can always try your luck in a thesaurus. That means that even if you can’t find a literal translation you will still get the meaning of the word. Finally, if you want to know how the word is pronounced you can get Fora Dictionary to say it for you by using the TTS (Text to Speech, Engine) tool. Another awesome feature is the fact that you can use Fora Dictionary with Moon+ Reader which is super useful when you’re reading foreign books or text books with lots of technical terms. Just highlight the word, call Fora, and behold, an explanation awaits. No need to worry about no internet reception, either—provided you’ve installed a suitable offline dictionary, that is. That’s a quick outline of some of the app’s features, but it has a whole lot more to offer: results/history can be exported or sent as HTML/text, Clipboard-Lookup, etc. Fora Dictionary is a great tool when you need to look something up quickly. It provides a great choice of dictionaries and formats and leaves little to be desired. Fora Dictionary is not going to wow you by its graphic ingenuity, but it’s really easy to use. The design may strike some of you as being somewhat simple but its well thought out and laid out in a logical way which makes it relatively easy to find everything. 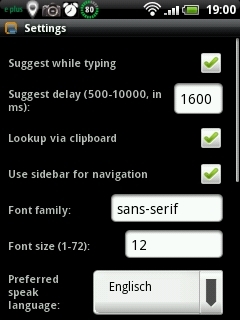 Fora Dictionary’s overall performance is good: it runs smoothly and steadily. 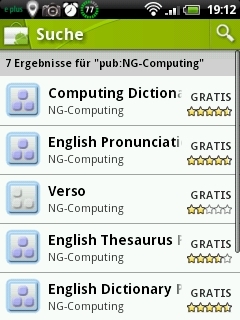 Fora Dictionary can be downloaded free of cost from the Market. The same thing goes for several of the dictionaries. Further dictionaries can be found on the internet, most of them for free. So far there hasn’t been a reason to contact the Support, but because of how much the app provides I don’t mind doling out a full five star rating. I have to say that I like QuickDic more as a German to English translator (due to the way it saves battery life) than Fora, but QuickDic doesn't have a regular dictionary function.